Before a raucous standing room only crowd, the game’s final outcome went down to the wire. The first quarter was marked by remarkable displays of speed, speed, and more speed, by both squads. Kennedy countered Hackensack’s height advantage with the bruising play of sophomore center James Hargrove on the inside. The Knights were able to forge ahead via excellent play provided by senior floor leader Jaylen Colon and fellow guard Jamir Lattimore. Hackensack head coach Aaron Taylor’s squad featured fellow seniors, guard/forward BJ Saliba Jr. and point guard Atiba Taylor Jr. Junior guard Jelani Carter and sophomore guard/forward Seth Brown also played significant roles. The four emphasized the versatility of the Comets. Carter is the shortest of the quartet, at 6’3”. Taylor Jr., Brown, and Saliba Jr., all measure 6’4”. Those heights usually register as forwards at the high school level. However, all four players can dribble well and also run the offense from the guard position, if needed. With Kennedy holding a 13-9 lead and 1:30 left on the first quarter clock, Lattimore snatched a defensive rebound. Soon thereafter, Colon flew toward the lane from the right wing and scored, despite hitting the hardwood after his shot. An offensive foul was called on Kennedy’s junior forward, Avante’ Gilbert. A 10-foot jumper by the Comets misfired but the rebound was tipped out of bounds by Kennedy. Saliba Jr. took one dribble from the right wing, pulled up, and hit a 20-foot jump shot. A personal duel developed between Hackensack’s Taylor Jr. and Paterson’s Colon, with both shadowing each other’s every move. Colon provided an acrobatic drive and score through the lane. Saliba then challenged Paterson’s Hargrove in the lane and was tagged with an offensive foul. Carter picked a pocket for the Comets and dished to Saliba Jr. The latter fired another pass to Taylor Jr. on the left wing who swished a 3-point attempt. The Knights answered with their own successful, long bomb. Taylor Jr. was fouled in the act of shooting for Hackensack and calmly dropped in both foul shot attempts. The second quarter saw Paterson Head Coach Tommie Patterson go with Hargrove at center, Gilbert at power forward, junior Gemir Robinson at the other forward position, and Colon and sophomore Deishon Harrison at the guard spots. Following a contact foul on Hackensack, the Comets got the ball back. Taylor Jr. pulled up for a long 3-pointer from beyond the key and missed. However, the steady senior grabbed the rebound and scored. Next, JFK’s Hargrove was fouled underneath the basket while shooting. Both of the subsequent free throws found their mark. The Knights’ Robinson then drew a foul by boxing out his opponent under the boards. Hackensack guard, Philip Reinhardt, missed a shot while driving to the bucket but the ball was knocked out of bounds. Kennedy’s Gilbert was fouled at the low post but missed the front end of a 1 and 1. With the Comets up by 4 points and 1:36 left in the first half, Kennedy had possession but Gilbert stepped on the out of bounds line while holding the ball. Harrison snagged a defensive rebound for JFK, wheeled, headed up court, and fired to Hargrove who muscled in for two. With 1:00 left, the Comets chose not to hold the ball for a last shot attempt but quickly fired up a 3-pointer. The miss ended up in Kennedy’s Hargrove’s hands. Shortly following, with the ball at his own left, low post, Hargrove pivoted and shoveled to Gilbert who was rushing toward the basket from right of the free throw line. Gilbert’s catch at full speed and buzzer beating, monster dunk resulted in an eruption of pandemonium by the Kennedy faithful. The halftime scoreboard read: Hackensack 31-Kennedy 28. 6’7” power forward Chandler Williams joined Reinhardt, Taylor Jr., and Saliba Jr., as four of the five Hackensack starters for the second half. Kennedy countered with Harrison, Gilbert, Lattimore, Colon, and Hargrove. Kennedy drew first blood as Colon was fouled while shooting and sank both attempts from the charity stripe. With Reinhardt directing traffic for the Comets, Saliba Jr. pivoted with the ball from the low, right post. In one of the more spectacular plays of the game, his across the lane move and simultaneous left handed, underhanded hook banked in. Fouled on the shot, Saliba Jr. converted the free throw for a 3-point play. Soon thereafter, Paterson’s Lattimore was nearly trapped in the right corner by two Hackensack defenders but managed to wriggle free. Colon followed with a pick pocket of a Comet pass and subsequent length of the floor successful layup. As intensity mounted, Gilbert’s dunk attempt for the Knights ricocheted off the rim but Lattimore backed up his teammate by blocking Saliba Jr.’s ensuing shot attempt from the lane. Williams and Taylor Jr. then combined for a score, but Harrison answered for Kennedy with a smooth 3-point rainbow from beyond the top of the key. With 3:00 left in the third quarter, Hackensack’s lead was cut to two points, 39-37. The Comets’ Taylor Jr. then showcased his athleticism with a sensational drive from the left wing and successful finger-roll layup from up close. A hubbub in the paint was solved by Comets’ senior forward Branden Houge-Hicks with a score. As contact continued to escalate under the boards, Paterson’s Hargrove was called for a pushing foul. Taylor Jr. then displayed his outside game by lofting a shot from the stratosphere which connected, much to the delight of Comet fans. However, the Knights responded with a drive to the basket by Colon and nifty assist to Robison for a 10-foot jumper in the lane. The Comets’ Saliba Jr. then gathered the ball in the paint, turned, and shot while driving to the basket. Despite offering an apparent elbow to his defender, no whistle was blown and the successful shot allowed. Despite the obvious height disadvantage, JFK senior Elijah Thomas battled for a board. Colon picked up a foul while guarding Taylor Jr. and Hargrove missed from underneath. The torrid fourth frame saw tensions escalate as the capacity crowd roared at every court exchange. After Hargrove picked up his fourth foul, Avante’ snuck behind the Comet defense for an easy cherry pick score. With 6:58 left in the contest, Taylor Jr. offered up an alley-oop pass to Williams. Although no dunk resulted, a Comet score did. The Knights quickly replied as Colon drove from the right corner, along the baseline, and under the basket. His kick-out to Kennedy guard, Joshual White, saw the confident junior sink a 3-pointer from deep in the left corner. JFK’s Lattimore again got in trouble in the corner but, again, managed to shake loose. He was then the beneficiary of an assist for an inside score. 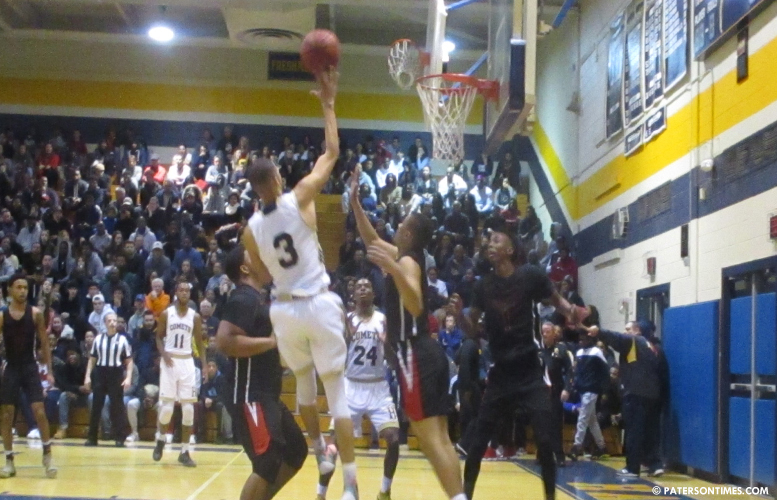 However, Hackensack’s Taylor Jr. responded with a long trey from the left corner. Up by one point, Taylor Jr. hit both ends of a 1 and 1. Hackensack took advantage of a long miss by Kennedy as Taylor Jr. jetted up court for a fast break bucket. JFK’s White answered with a sensational drive and score. The Comets missed a 3-point attempt but the rebound was followed with a successful put back. As Hackensack brought the ball up the court, Colon and Harrison gave the Comet guards fits. Colon wound up with a steal, cruised from midcourt to the basket, and was hammered while shooting, by Williams. Hackensack Coach Whiting called time out between the two subsequent foul shots. Following the dribbling wizardry of Taylor Jr., the Comets notched a two-pointer. With his team behind 63-57, Colon swished two more, clutch free throws for the Knights. Hackensack’s height again came to the forefront as Williams rejected a Kennedy offensive offering. Taylor Jr. followed by sinking 1 of 2 free throws. A wild series of loose balls and tangled bodies finally resulted with possession Kennedy. Gilbert found himself with the ball at the low post, swarmed by Comet defenders. His desperation pass to Lattimore, left all alone in the deep, left corner, resulted in a nothing-but-net 3-pointer. Ahead 65-62 with 52 seconds left, Hackensack broke Kennedy’s full court pressure. Carter was fouled while shooting from the lane and knocked down both free throws for the Comets. Led by the rebounding of Williams, Hackensack managed to hang on to their slim lead. With 10 seconds left, Taylor Jr. passed up a shot attempt and fittingly had possession of the ball as the final buzzer sounded. The Comets had escaped by the narrowest of margins and with a hard-earned victory. Taylor Jr. led all scorers with 29 points. Saliba Jr. contributed 12 for the Comets. Colon led the scoring for Kennedy with 18 tallies. Hackensack will face North Bergen on Monday night for the state tournament championship title of the North Jersey Section 1, Group 4 category. Correction (Mar. 3, 2018): A previous version of this report erroneously stated the coach for Hackensack was Gordon Whiting when in fact it is Aaron Taylor.